Meteorologists have confirmed Hurricane Lesley is moving towards Derry and the rest of Ireland - here's what we know so far. Could Hurricane Leslie affect the North of Ireland? Hurricane Leslie is currently out over the mid-Atlantic Ocean area. Yes but it's too early to give a definitive answer as to the exact impact, if any, it might have. Met Eireann meteorologist John Eagleton confirmed Hurricane Leslie was moving towards Ireland. "Leslie is currently horizontal to the Republic of Ireland, in the middle of the Atlantic Ocean. 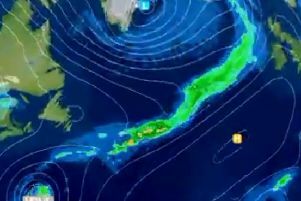 "It does look as if it's coming in our direction, and should be in between Iceland and Ireland in 10 days time as it gets sucked in by the jet stream." Met Office Chief Forecaster Andy Page: “Some models suggest Leslie will track south of the UK while others suggest it may move close to the UK by the end of next week. A spokesperson for the Weather Channel said: "There has been a lot of uncertainty in the forecast for next week with computer models struggling to resolve the track of hurricane Leslie. "Latest models take the remnants of Leslie into northwest Europe with a push of warmer air from the south across western and central Europe. "However, there still remains time for the forecasts to change once again." Where is Hurricane Leslie now? Hurricane Leslie: Could it be heading towards Derry? The category one hurricane is currently out over the mid-Atlantic area and could arrive in the UK towards the end of next week. Will it still be a hurricane if it arrives here?